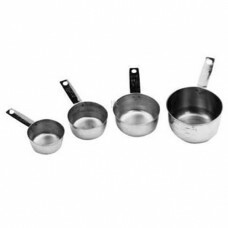 Designed specifically for popper use, this convenient set includes four long-handled cups, 1/4, 1/3, 1/2 & 1 cup, stainless steel (measures your popcorn and oil). Each cup has graduated markings and is for use with 4, 6, 8, 12, 14, 16 and 20 oz. popcorn machines.